Every village and city in Italy has a patron saint. San Giuseppe (St. Joseph) is the patron saint of La Spezia, which is the nearest city to the Cinque Terre (just 8 minutes by train from Riomaggiore). Aside from religious festivities, the city offers a huge street fair (fiera) with over 600 stands selling everything from household goods and clothing to culinary specialties. It’s an event that locals look forward to each year! 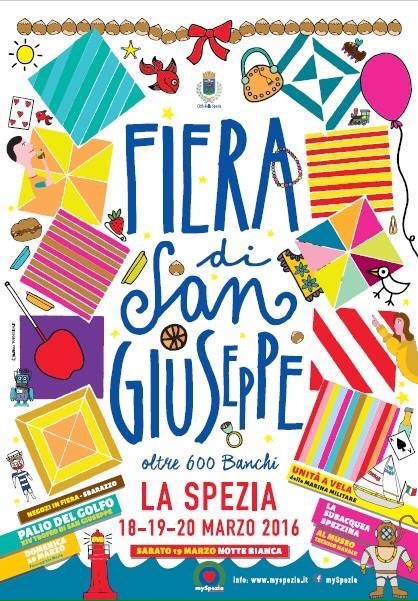 This year you can witness the fiera in La Spezia the 18, 19 & 20 of March. On Saturday night (March 19) there will be a Notte Bianca (literal translation: White Night), which means the stands and shops will stay open later. Usually the Notte Bianca has a few street performances thrown in the mix as well. If you’re not a fan of crowds, you’ll want to hit up the fiera in the early morning. Based on personal experience, I wouldn’t wait to attend until the evening of the last day (as the vendors start packing things away before the official closing time). Because it’s super popular and you’ll be elbow to elbow with other spectators, you’ll want to be extra vigilant of pick pockets. Previous Previous post: Limit on the number of visitors to the Cinque Terre in 2016? Nope, not happening.